I have always loved the sparkle of chandelier crystals, and they’re not just for light fixtures and wind chimes. They can be ornaments and pendants too. 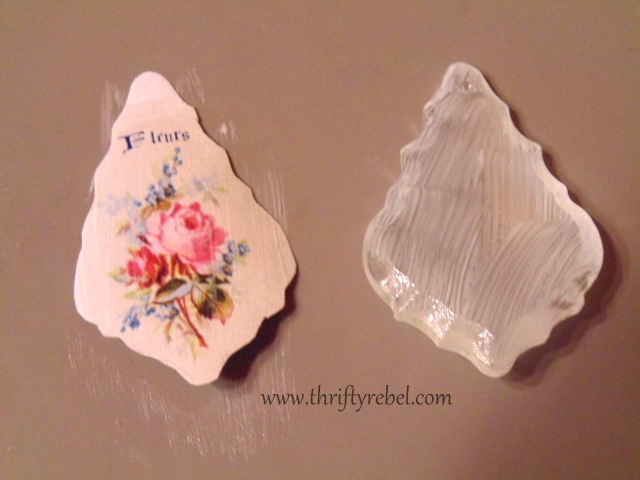 A while ago I was lucky enough to thrift a box of mixed vintage glass chandelier crystals, which included about 80 lovely vintage prisms that are faceted on the front and flat on the back… just perfect for decoupage projects. 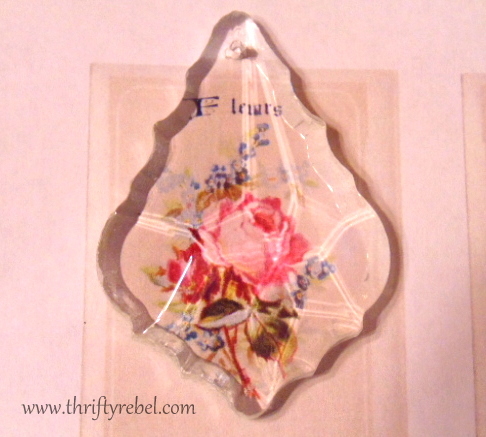 A few weeks ago I showed you my french inspired decoupaged chandelier crystal tree ornaments that I made. 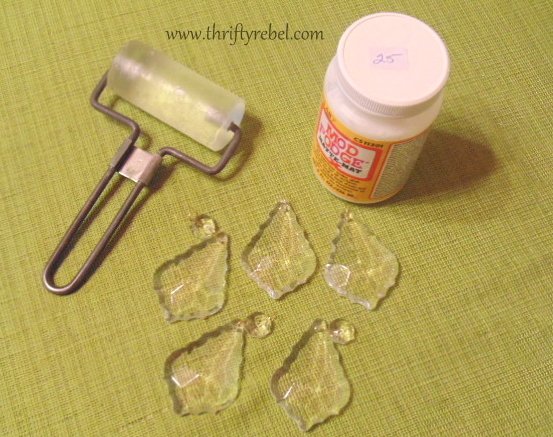 Anyway… today I’m sharing how to make a reverse decoupaged chandelier crystal pendant, which is the exact same process. You’ll need some Mod Podge (I used a matte version because that’s what I had), a breyer, and some chandelier crystals with the flat backs. You could experiment with the crystals that are faceted on both sides, but I haven’t tried that yet. You can use any graphic you like. 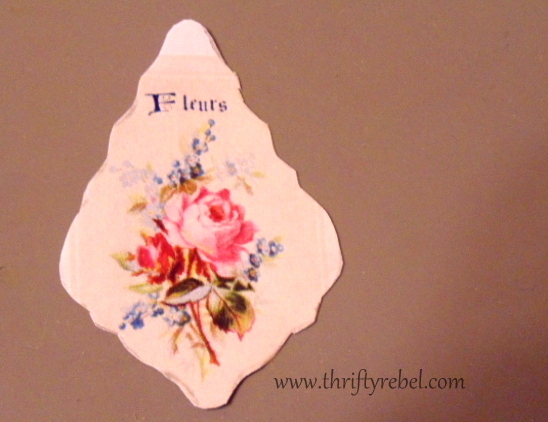 I found this pretty french floral graphic on the Graphics Fairy site. I saved it to my computer, resized it to make it small, and printed it on good quality 20 bond white copy paper. I’ve also used watercolor paper, and that works well too. Place your crystal on the graphic until you’re happy with its position. Mark the outline of the crystal with a pencil. You’ll have to hold the crystal down firmly so it doesn’t move as you make your way around. Unfortunately I only have two hands so I couldn’t take an action shot. After you cut it out with scissors there may be some remaining pencil marks. Simply remove them with an eraser. Be careful not to press too hard, and try not to handle the front of the image too much. 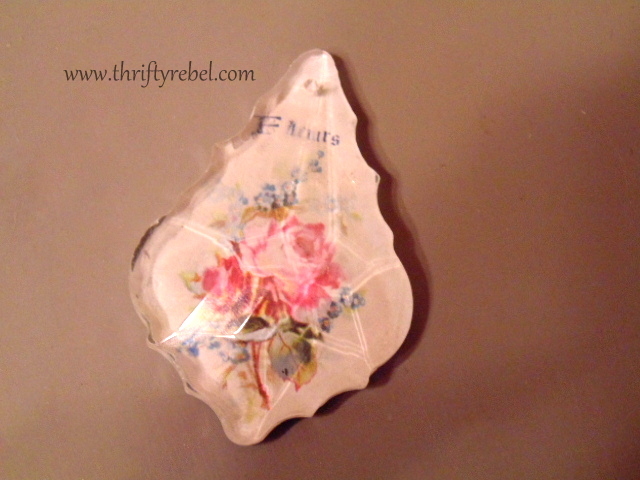 Spread a light coat of Mod Podge on the back of the crystal, including the faceted edges, and on the front of the image. It’s very easy to spread too much MP here so be careful. If you use too much it’ll be oozing out everywhere. 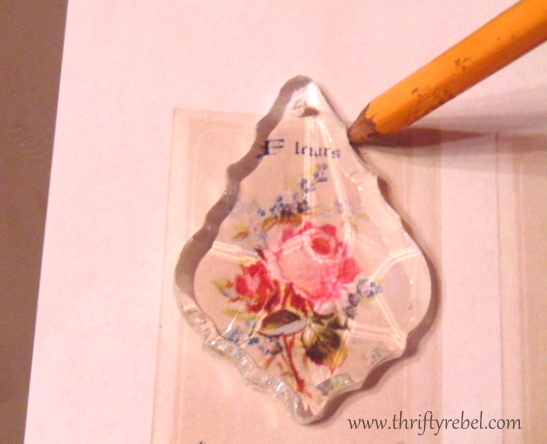 Place the front of your image onto the back of the crystal. 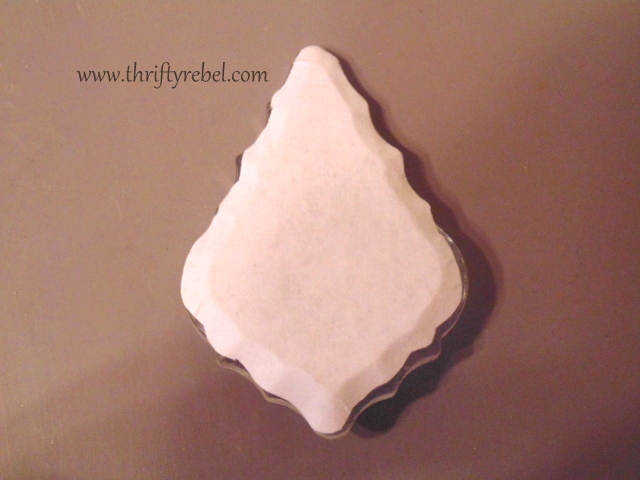 Gently flatten the image on the back with your fingers and press into the faceted edges. 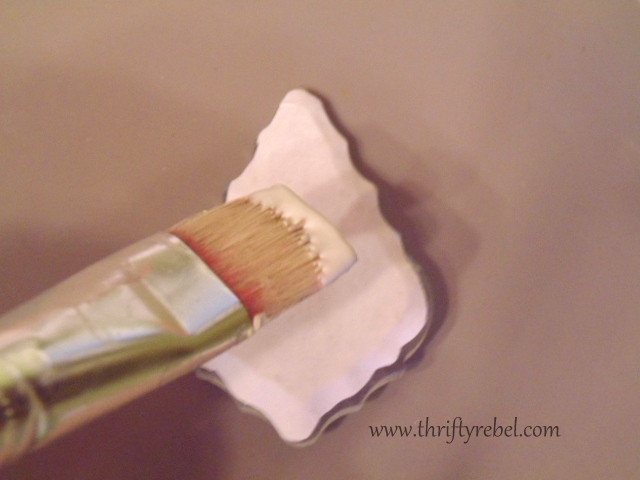 Remove any excess Mod Podge that oozes out with a paper towel. This is what the back looks like once the graphic is in place. 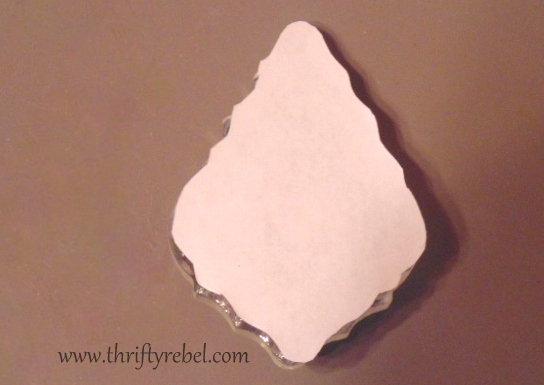 Don’t worry if it doesn’t perfectly match the faceted outline of the crystal. Believe me when I tell you that it’s not going to be perfect no matter what you do. Embrace the imperfection… and don’t stress it. Handmade things don’t have to be perfect. I only use the breyer because I have it, and it does help to spread out the MP under the paper. You’ll notice here that the image appears to have faded. 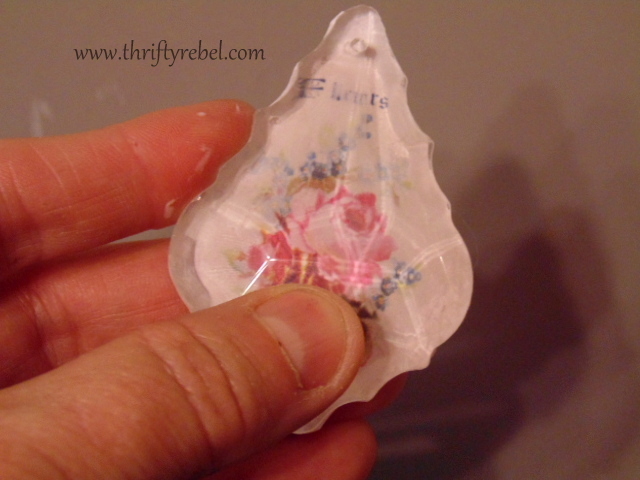 That’s just because the Mod Podge hasn’t completely dried yet. I always apply 3 light coats of Mod Podge to the back letting it completely dry in between. 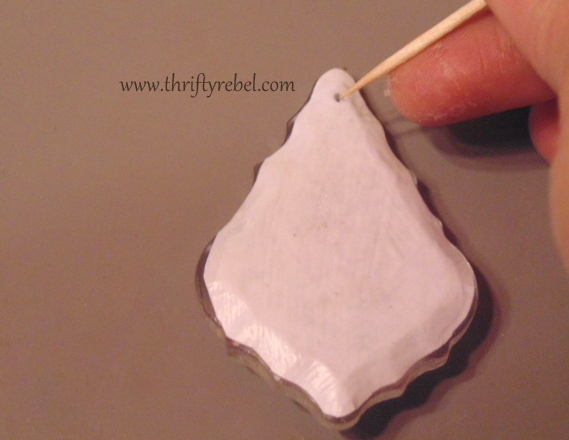 It’s important to apply the MP along the outside of the paper along the faceted edges to create a good bond and seal. Again, remove any excess MP that gets on the crystal. Once the back is done and competely dry use a toothpick to poke a hole in the paper where the chandelier crystal hole is. Add any type of bail you like for hanging. I like to use pinch pendant bails. Make sure the paper is completely dry before attaching the bail or you might tear it. 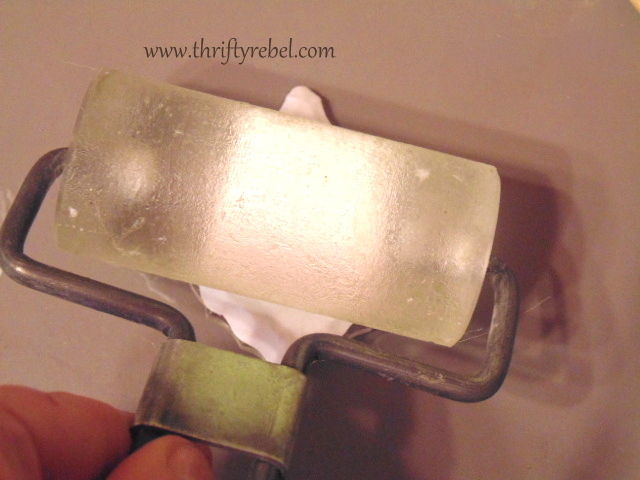 To attach the bail you simply place each end into the hole on either side of the crystal and pinch the bail closed. It’s that simple. And Voila. Just like that a unique piece of jewelry is born. I used a thrifted silver chain from my stash for hanging. I love how the facets on the front of the prism play with the image underneath. It looks a little different from different angles. 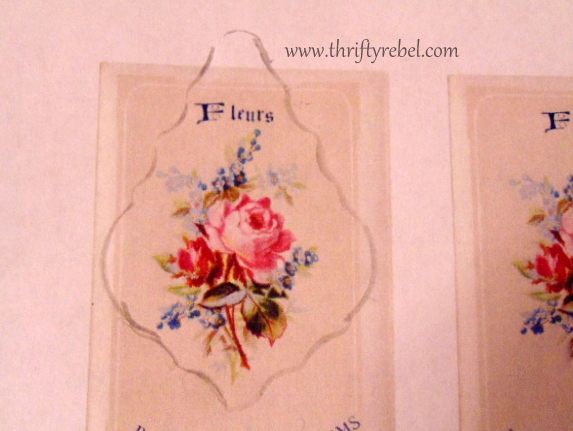 These could be personalized so easily, and would make fabulous gifts. The possibilities are only as limited as your imagination… which I know is limitless. Thanks so much for reading. Merci beaucoup. Sprinkle some sparkle somewhere today, and smile. A well written tutorial and excellent pictures Tuula! 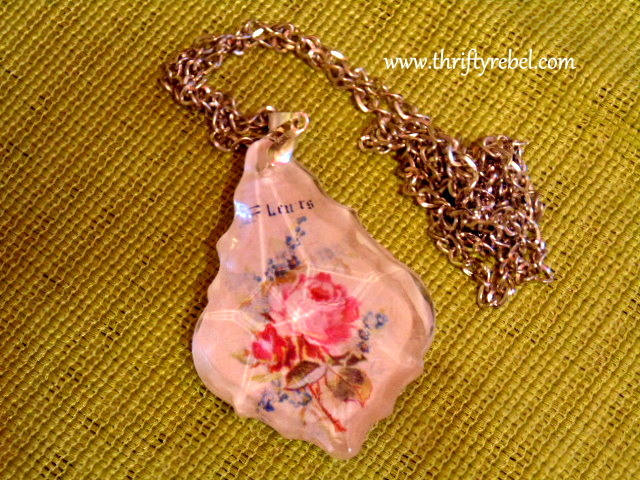 The necklace idea is genius and I love the pink background! Thanks Karen! I think I'll be making a bunch of different ones for Christmas gifts this year. Love how these crystals turned out and what a great tute . . . and she speaks French, too! I'm just getting into decoupage and I'm adding this to my techniques. Like you said, the possibilities are almost unlimited for creating great pieces. Oh my goodness, this is so clever. I love the paris ones too. I will have to pay attention to crystals now ti find ones with flat backs. I would love a white Christmas tree with these all over it. Or hung around the bottom of a lampshade or.. Gotta run find dome crystals. Beautiful!!! Awesome project!!! Thanks for sharing great tutorial! Chandelier crystals aren't just for lighting any more. 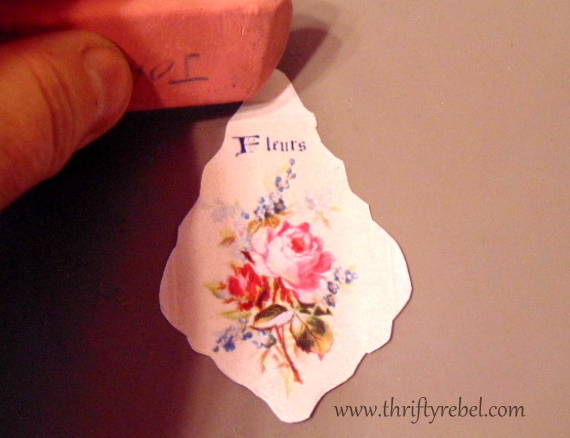 Love this idea and the great tutorial. But I have no huge box of crystals….sigh. 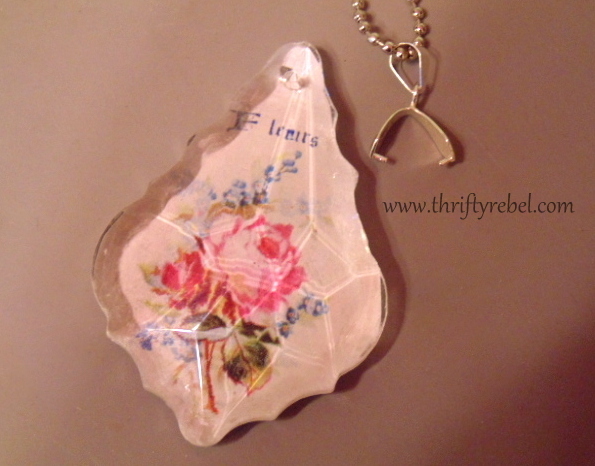 Wow Tuula, that necklace you made is so pretty and very creative of you! Those are just gorgeous Tuula! Now I need to keep my eye out for some crystals. Your posts always seem to add to my thrift store list in a beautiful way! Thanks! Oh so pretty Tuula! Funny when I saw the word breyer… I would've called it a roly thingie. I thought breyer only made ice cream LOL! Have a great weekend friend! What a Wonderful tutorial. I so appreciate the step by step instructions. Very helpful. Thank you. I'm going have to go dig out my box of crystals that I have collected over the years. I've made these before, and yours are lovely! Thanks for sharing your great step by step tutorial with us at Make It Monday! Thanks so much Mitzi! They are so fun and easy to make. These are lovely! 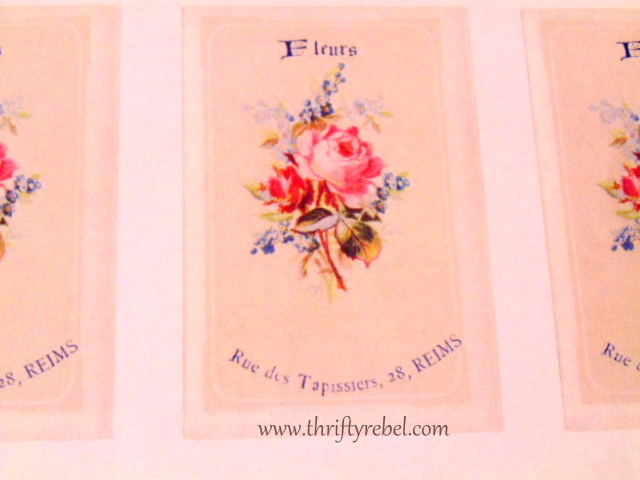 Thanks for sharing them at the Vintage Inspiration Party – I'm featuring you at Knick of Time this week! 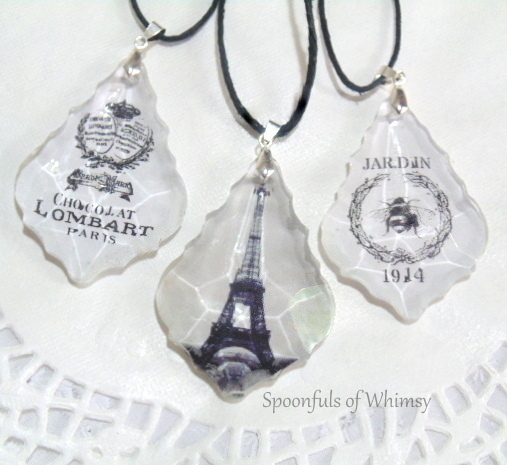 Cheryl from Wisconsin made me some of these but magnet holders – Paris themed. I have a ton of chandelier crystals – thanks so much for sharing !!!!!! Love this. 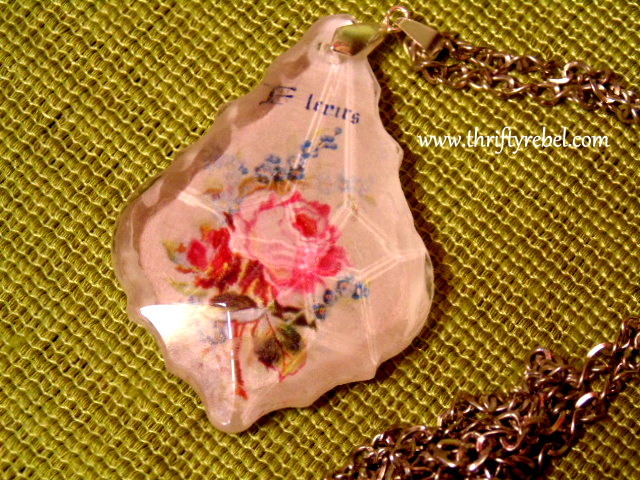 I have some acrylic pendants. Wonder if it work on that. Probably wouldn’t look as nice. I want to try this. Love the idea. Great tutorial. Thank you, might do that.